The Jaguar C-Type – the sports car icon of the early fifties. 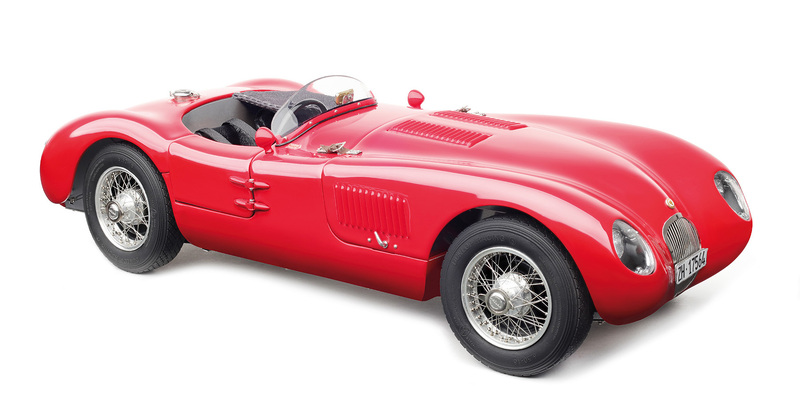 The C-Type developed for use in motorsport from the XK120 was completely new except for the optimized engine. Jaguar won the overall victory in Le Mans twice with the C-Type. Between 1952 and 1955, racing teams with the C-Type won many (class) victories in national and international races. 53 copies of the C-Type were made in Coventry, including four lightweight chassis. CMC has studied Dr. Jenny’s C-Type (XKC 023) meticulously. The result is a CMC-made miniature highlighting the impressive charisma and sporty dynamics of the original. In his or her wildest dream, every collector hopes to be lucky enough to pull a car out of the barn in a rusty and dusty condition, but of so much importance that it would astonish the professional world. This was what happened to Dr. Christian J. Jenny and his C-Type XKC 023.Chassis XKC 023 was first delivered to Charles Hornburg, Jaguar’s US West Coast importer in late 1952, and it was directly transferred to Joe Henderson, a Jaguar dealer in Seattle. 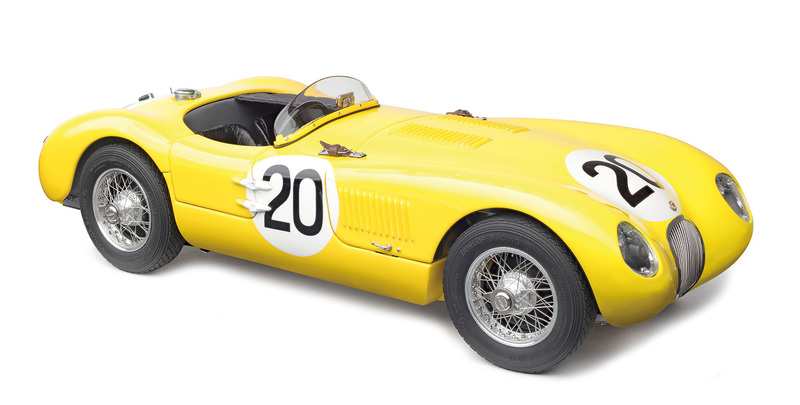 In August 1953, the car took part in a race for the first time — the Seattle Seafair 100-mile race, and it was driven by Bill Pollack and Jack Douglas. The latter was a comedy writer and television producer, well-known for his close relationship with Hollywood celebrities, including Mitzi Gaynor, leading star of “South Pacific”. Jack Douglas became the first owner of the sleek, fast XKC 023, and he took every opportunity to show off his vehicle and girlfriend. Also, racing was in his blood, so the C-type was frequently and successfully used in local racing events. After an accident, in which XKC 023 took considerable damage on the body side, the interest of the amateur racing driver in his C-Type dwindled. The vehicle remained on the US West Coast. In 1962 it came into the possession of Frank Schierenbeck, owner of a repair shop for European sports cars. With him, the C-type stayed until 1997, but knowledge about its whereabouts had faded into obscurity from the mid-sixties. Search for the missing Chassis XKC 023 began in 1986, and the car was found in 1997, albeit in a state of disassembly. In November 2000, XKC 023 was put together once more. Hardly completely restored, it participated in the Mille Miglia Storica 2001 with Jenny/Werdenberg at the wheel. Two years later, Dr. Jenny took XKC 023 to the celebrations in honour of the C-Type win at Le Mans 1951. In May 2006, the vehicle received the coveted FIA heritage certificate. 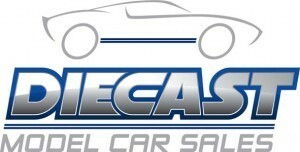 Tags: 1952, 1:18, 1:18 Diecast, Best model, C-Type, Carlectables, CMC, Jaguar, Model Car, XKC.